Because it’s golf, Phil Mickelson’s life and legacy changed during the weekend, both taking on a stain that may be permanent. Because it’s a sport that holds stuff like etiquette, decorum and sportsmanship holy, Mickelson did something he shouldn’t have and got crucified for it. All at once the man with the 43 PGA Tour wins, including five major titles – the affable lefty who might be the most popular player with fans – became the guy whose unbecoming 13th-green meltdown at the U.S. Open was the talk of the weekend. His stunning rules violation might now be the most irreversibly indelible stamp on his name, maybe right there with the three Masters green jackets. That’s too bad. It’s on him, yes. But it’s still too bad. It’s too bad that one 10-second lapse resulting in a two-stroke penalty might leave a permanent scar. “He didn’t rob a freight train,” as my dad might have said. He just did something dumb, that’s all. If in that moment you kill somebody, then no. But if in that moment, you putt a golf ball while it is still rolling so it doesn’t scoot off the green, well, Mrs. Mickelson may have a point. It is not at odds to think that what Mickelson did was outrageous and that he probably should have been disqualified in addition to being penalized – but also to believe this is not a breach so heinous that it should follow the man to his grave, sullying all he has accomplished. 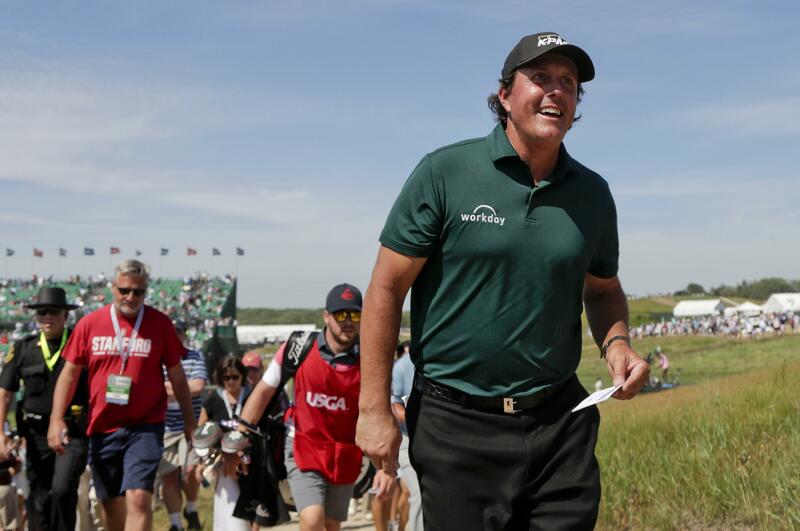 The story here isn’t what Mickelson did, but our reaction to it. Our capacity to measure it in the context of a long, positive career, and to forgive. It happened on Saturday, Phil’s 48th birthday. The greens at Shinnecock Hills were rolling like they were made of glass. That’s why Brooks Koepka’s winning score was 1-over par. The course won. So Mickelson touched his putt and it rolled well past the hole, and kept rolling on a downslope, headed for off the green entirely. That’s when Mickelson trotted after the rolling putt and as it was moving putted it back toward the hole. “Noooo!” you heard someone in the crowd gasp on TV. “Whoa. Wow,” said Fox’s Curtis Strange. “That’s stunning,” said Joe Buck. “I’ve never seen that from a world-class player in my life,” said Strange. I watched the replay 10 times and my jaw dropped every time. Twitter exploded, and the USGA penalized Mickelson two strokes under Rule 14-5 about striking a moving ball. He might have been disqualified had they applied Rule 1-2, about purposefully striking a moving ball to gain significant advantage. Golf’s rules can be fussy, persnickety, but they are why the sport has the atmosphere of sportsmanship that it does. There was zero question Mickelson did what he did on purpose. He knew the rule, and exploited it. He took the two-stroke penalty to avoid watching that ball keep rolling. He walked off that green with a big loopy grin, which probably didn’t help. Mickelson intentionally broke a rule because he calculated that the penalty would serve him better than the alternative. You want to prevent that from happening again, golf? Stiffen the rule to make the punishment a four-stroke penalty, an automatic disqualification or even a suspension. All Mickelson did was play the system because it allowed him to. He nevertheless offered Saturday night to withdraw, but the USGA told him his two-stroke penalty was sufficient. What Mickelson did I have seen done before. But it was during a casual round at Weedrot Municipal, by a buddy six beers in en route to shooting around 120. We all laughed. But that wasn’t Mickelson. On national TV. In the U.S. Open. In infamy, what he did will live on as one of the most memorable putts in the history of golf. But in fairness, the words of his wife should live on, too. Published: June 18, 2018, 4:16 p.m. Updated: June 18, 2018, 4:19 p.m.